Sometimes, there is a need to introspect and listen to our inner child. 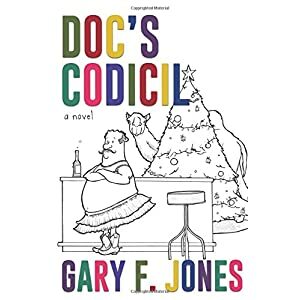 Doc's Codicil is a book that lays emphasis on doing just that. What the Doc had learnt in his life, he wanted to pass on to his children, especially after his death. Hence, he wrote a codicil to his will. The story has a great plot and ensures frequent yet meaningful transitions in time frames (past, present and future to be precise!!!). The narrative is fast paced and ensures that a reader looks forward to what is in store next. Gary has a great sense of humour which he aptly projects through this story. There are many portions that you would love to read again and again in order to re-live through the funny moments narrated. In fact, the descriptions have the power to trigger vivid visual imageries. However, there is too many details regarding animal sciences which I have little knowledge of. Since I couldn't appreciate these portions due to lack of understanding, I am forced to give this book a four star rating. But yes, I do look forward to read more of Gary's work, because, I am sure, his next book will take care of such minor issues. Characterization is interesting. Each of the Doc's children, his lawyer friend, Doofus and even the nondescript ones have a well etched role to play in thiz story. Coming back to the concept of introspection, I too agree with the author that there is a need to bond more with family members. To tell the truth, it is vital that more and frequent investments are required in relationships. Quality time spent on family relationship is the best investment that can ever be made. And yes, there is also a need to take risks. Sometimes, one has to risk it all in order to be happy. To sum up, but for few technicalities and nuances I couldn't comprehend, the book is definitely a must read for all the humour it has to offer along with a wonderful plot. P.S- I received a copy of this book in exchange for an honest opinion. Thank you Legit Lit Book Tours.